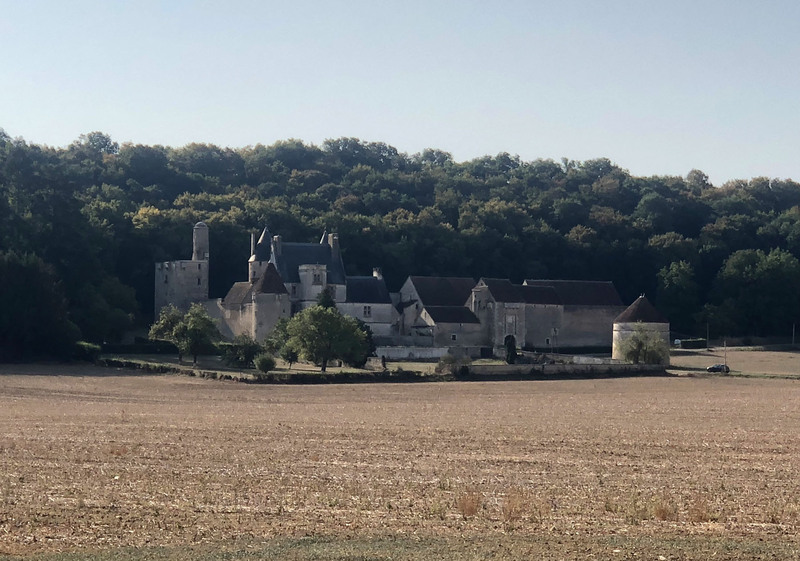 The best way to see the Burgundy Valley of France? 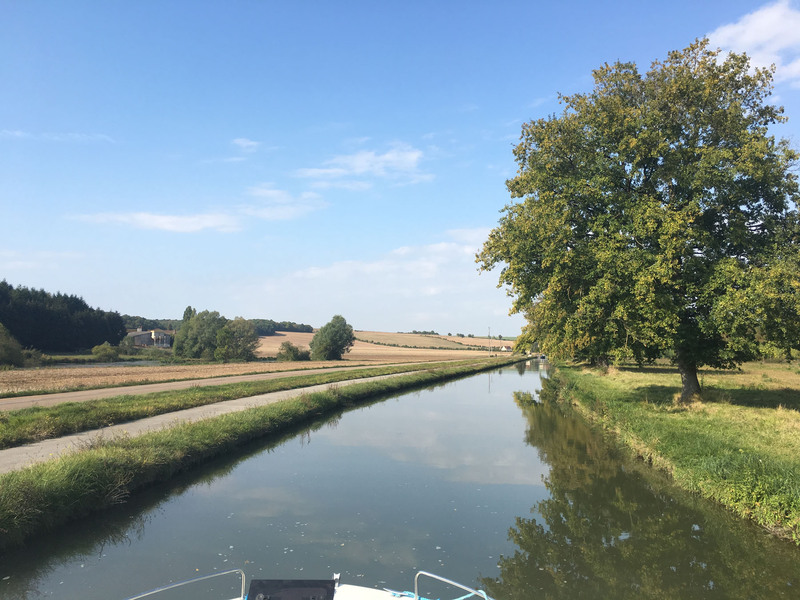 By boat! 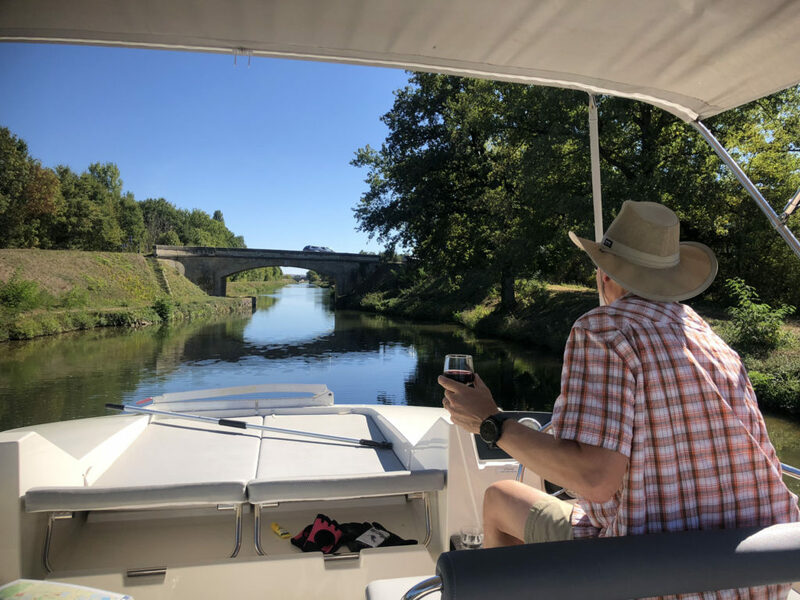 Imagine chartering your own yacht to ply scenic rivers and canals through the French countryside, passing castles, vineyards, pastures and ancient villages. 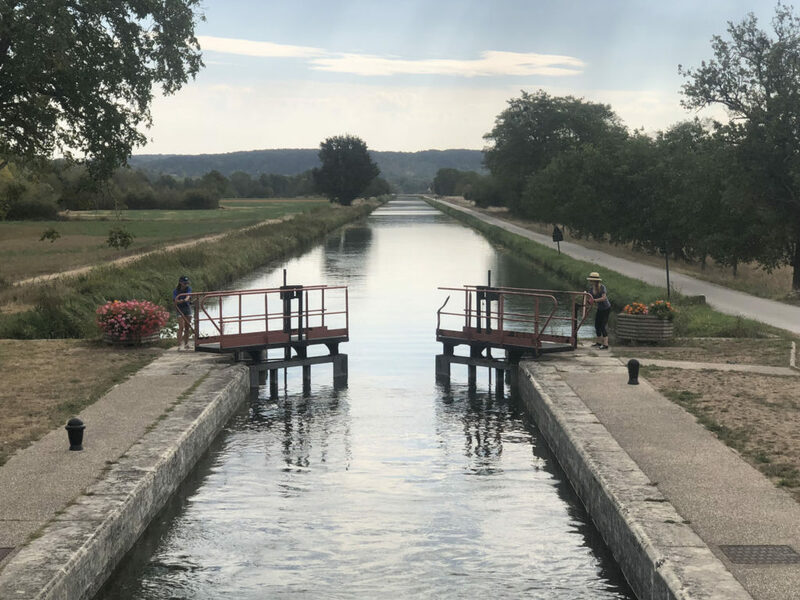 Part of your voyage is navigating historic canals and locks, and of course at every port – there’s Burgundy wine, French pastry & cheese- yes please! We chartered Le Boat, to tour the Route de Grand Cru – the wine rich Yonne River and Canal du Nivernais for a week. 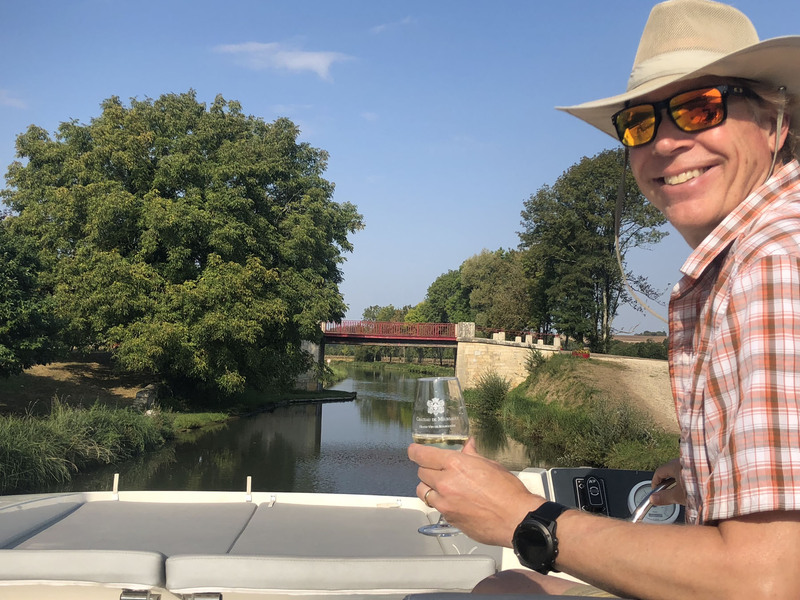 Aside from the slow cruising on the River, we explored ancient villages as our ports of call, and toured hillside wineries by bikes (stored on board our swim platform). The hard part was choosing from Le Boat’s extensive fleet and countless itineraries of Ireland, Scotland, Netherlands, Italy, Belgium, England, Germany, even Canada. 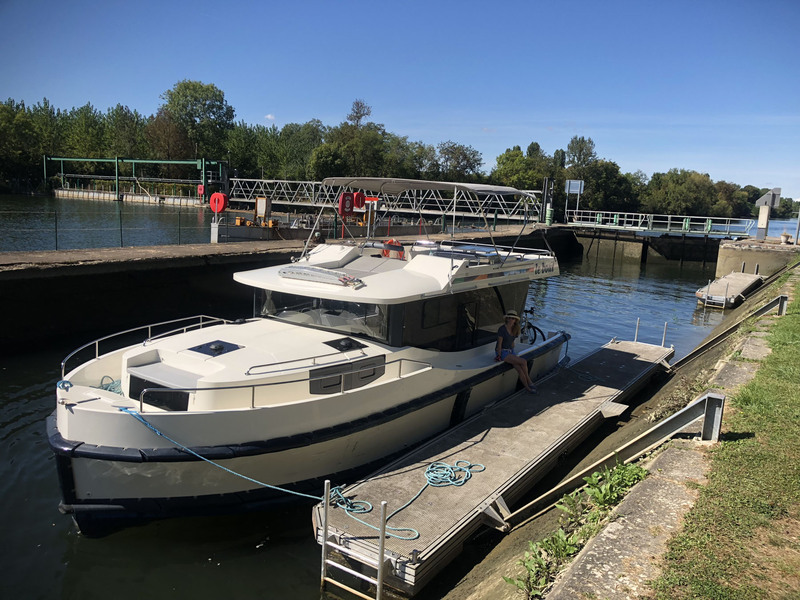 Our spacious 38’ Horizon boat was perfect for my husband and me, with a modern bright salon, full galley, head, V-berth stateroom, small twin bed room, plus upper and lower helms – in the cabin and up on the fly bridge with a commanding view. 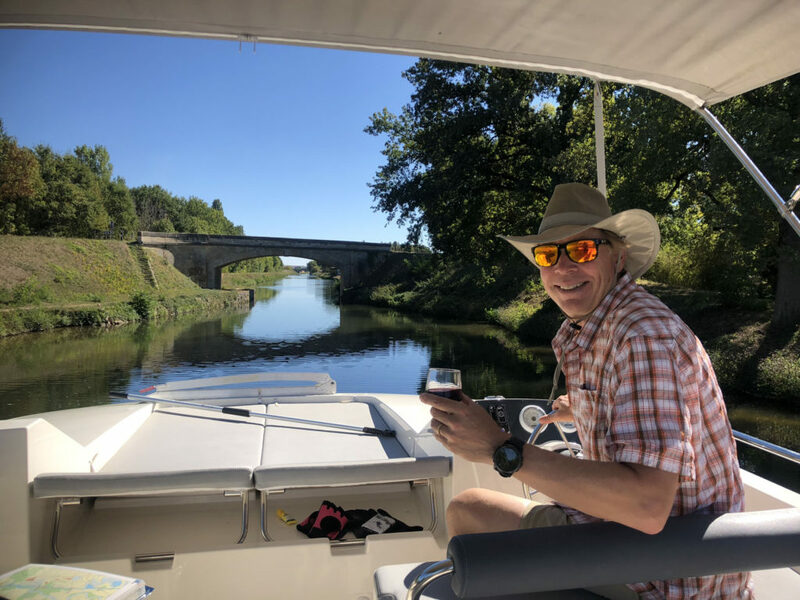 This upper “fun deck” was our favorite space both for cruising and when in port, thanks to a large table, cushioned benches, a sun bed, BBQ grill and Bimini. 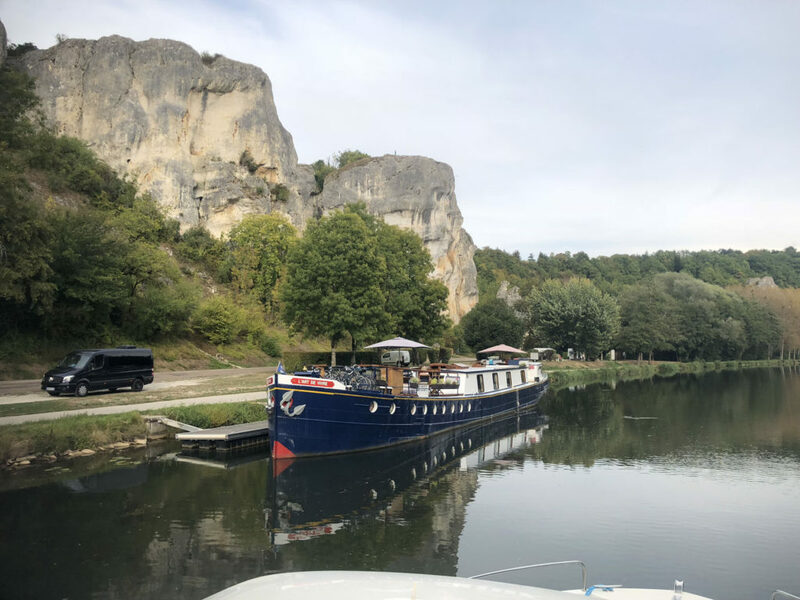 During our cruise we encountered several other Le Boats that slept as many as four couples, a great way to share the adventure and the cost. 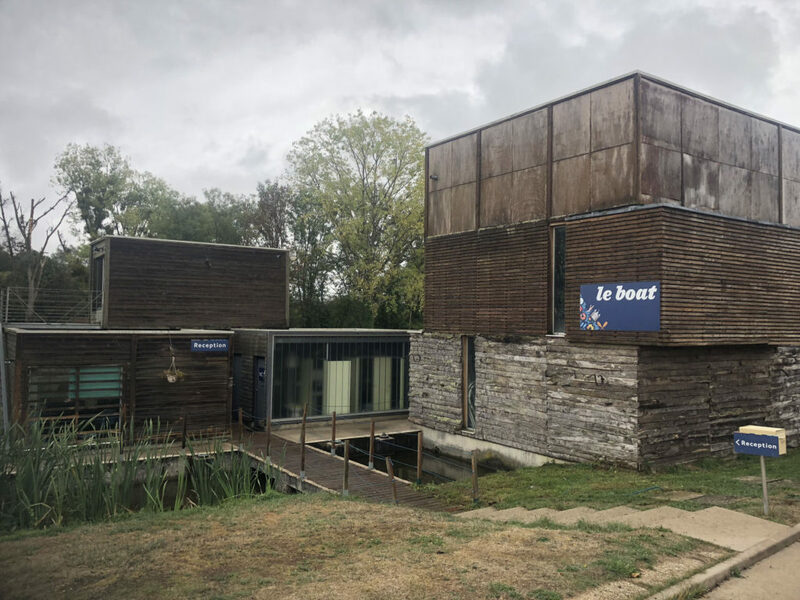 Orientation and training aboard Le Boat at Migennes, two hours south of Paris, was swift but thorough, and in English – the majority of their clientele. 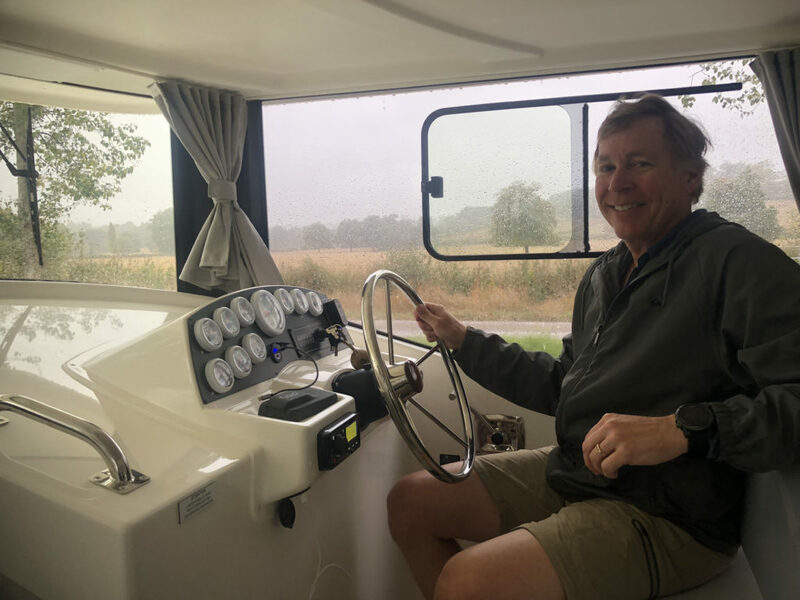 The 50-year charter rental company claims you need no boating experience, and the boats are protected with rubber fenders around the hull for novices. 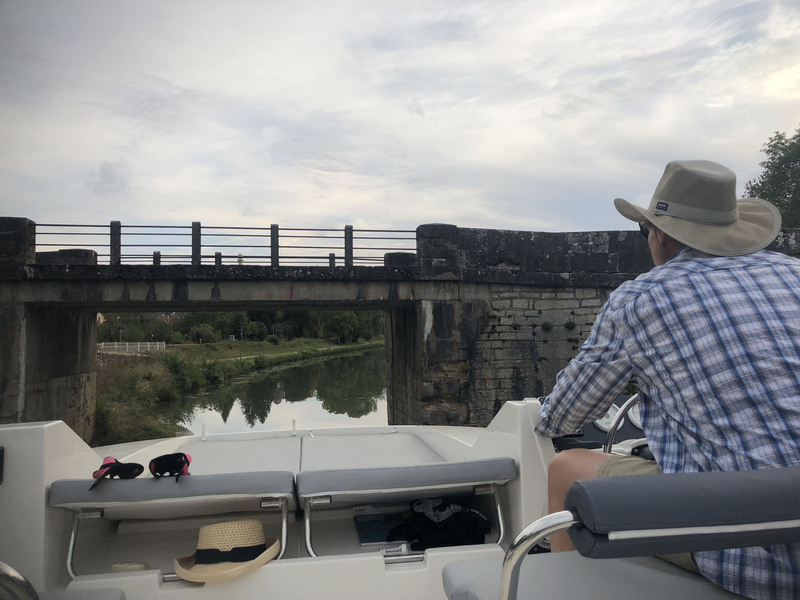 Still, we suggest some basic boating cruising knowledge, even though this is much slower, more stable and straightforward than we’ve experienced (versus boating the coast of Maine, the BVI or the fjords of Norway for example). 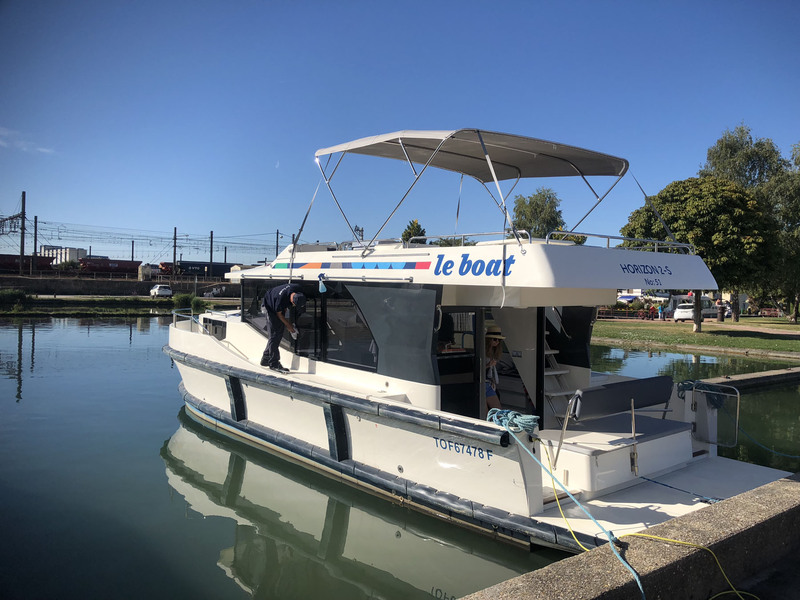 Le Boat’s crew wished us “bon voyage” after our tour of on board systems, and a quick docking test-drive in harbor. 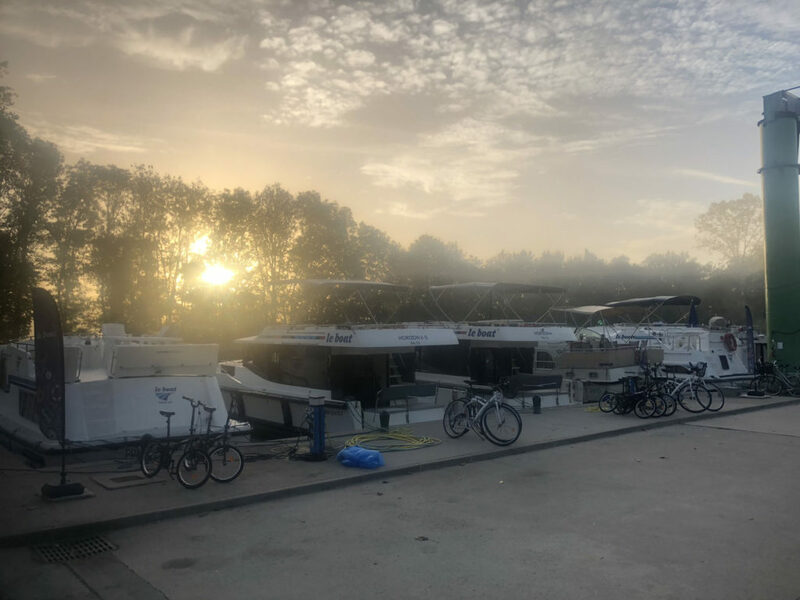 They promised to be a call away 24/7 with any issue, even a problem with our rental bikes they’d secured on our stern swim deck. 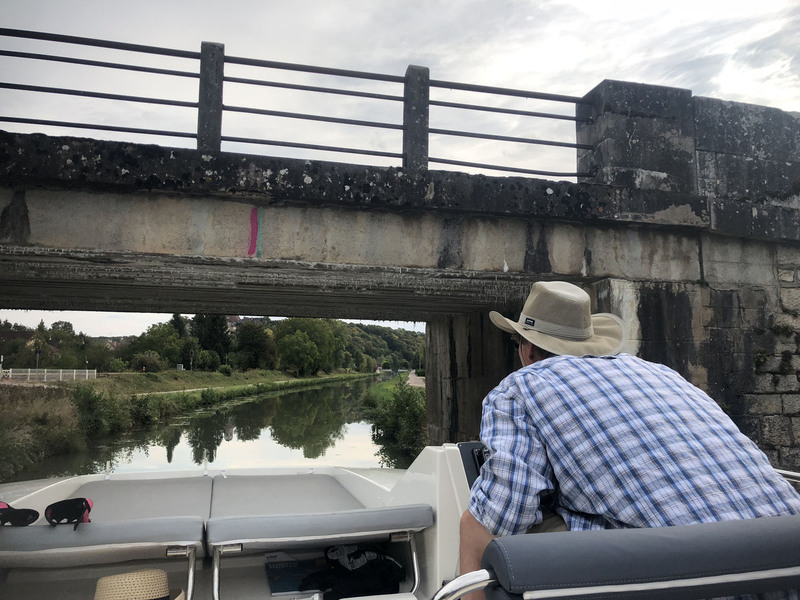 Cruising the Canal aboard Le Boat was immediately pleasant, the river’s docile current doesn’t rock the boat, the only commotion was passing another boat or passing through the old manual locks – originally constructed from 1784 to 1841 to transport timbers to build Paris. 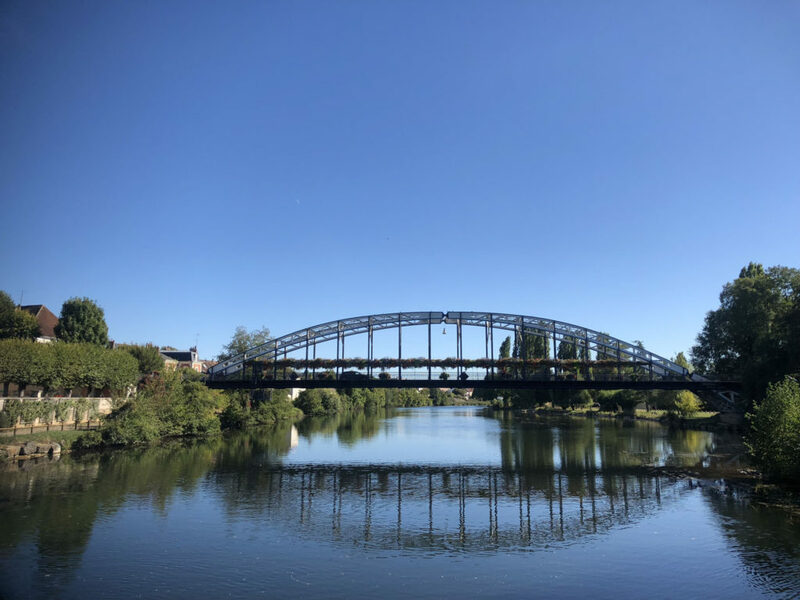 French scenery as you glide along the waterway at 5-kilometers an hour is of gorgeous landscape, white cows grazing the river banks, and lush rows of grape vines climbing the hills, with the occasional castle or church spire towering out of the next French town. The Canal Locks are cool, mechanically operated for over two centuries by “éclusiers” (lock keepers) who crank the gates open and closed upon the arrival of boats (first come first served), filling the narrow stone holding cells that vary in height from 1 to 4 meters of water, fitting 1 to 3 boats inside the “écluse”. 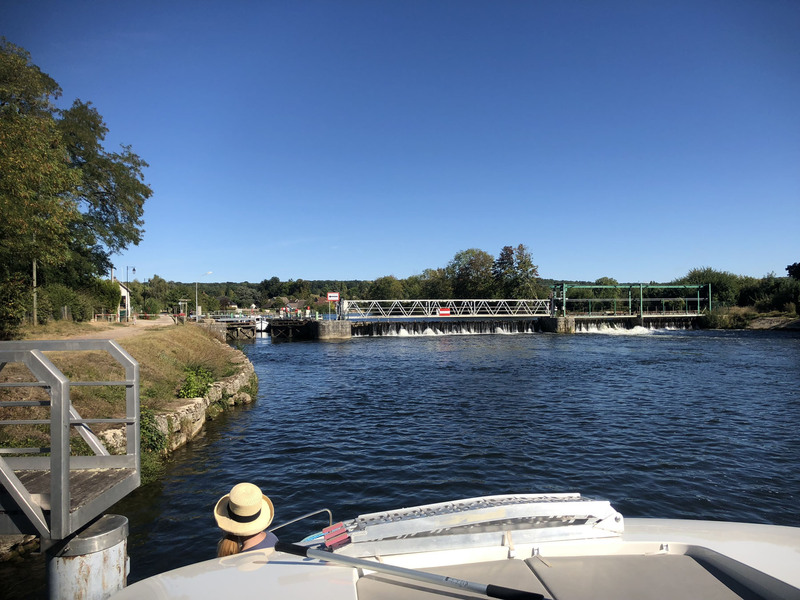 We quickly learned the lock procedure, my captain appreciated the bow and stern thrusters to navigate with, while I looped bow and stern lines around pylons and back to the boat to tighten as our boat rose with the rush of incoming water. Note: bring gloves to handle the wet, messy lines. 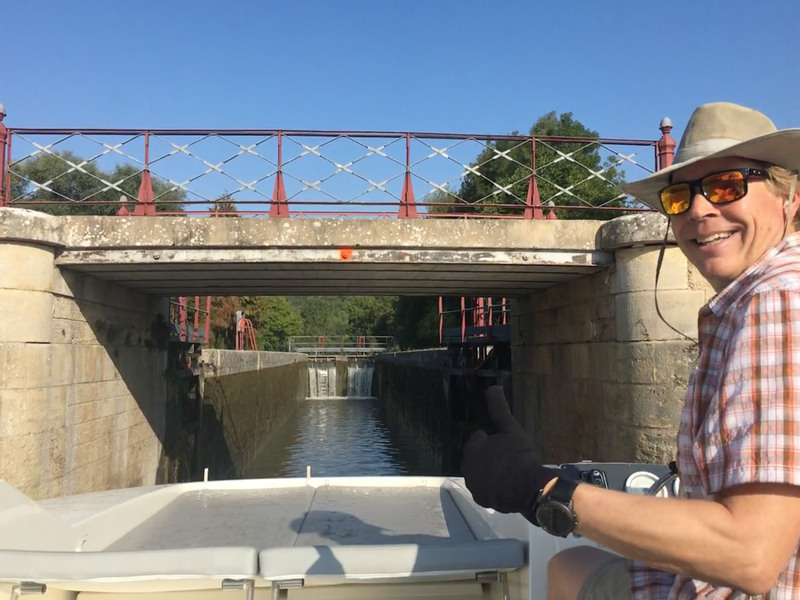 After a few locks, we even helped the lock keepers for fun, and to expedite our voyage. 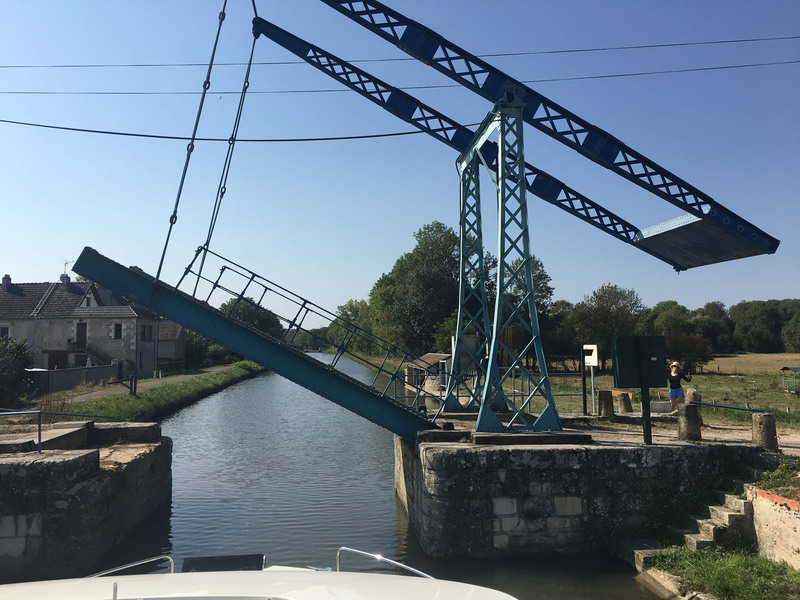 In our week, we’d pass through 50 locks in the Canal du Nivernais, one-way 100-kilometers – Migennes to Tannay. Our first day boating in glorious September sun, we arrived in the historic town of Auxerre to dock along the Quai and pedestrian boardwalk ($12 Euro a night to the marina including shore power and water). 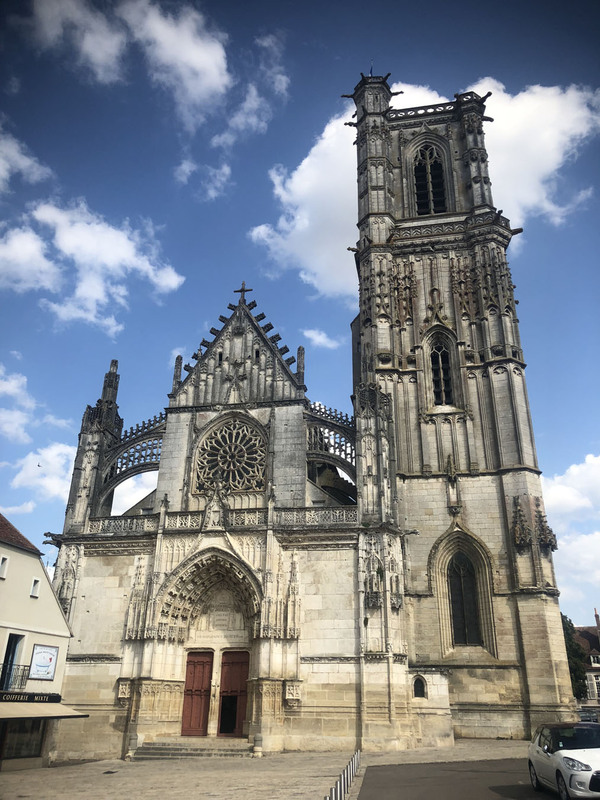 We celebrated with surprisingly hot showers on board and a toast of Burgundy wine on our top deck in the shadows of Auxerre’s towering churches and medieval village. 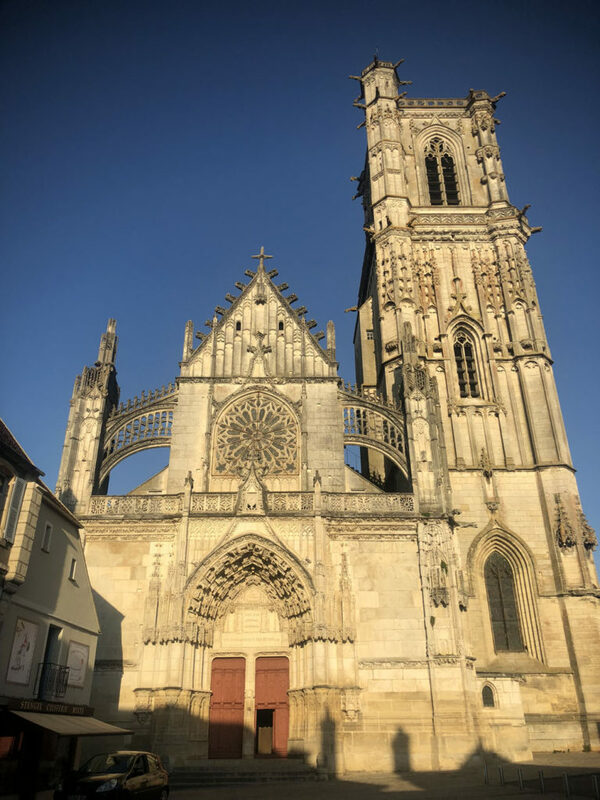 Auxerre’s best sights were steps from our boat, cobblestone pedestrian squares filled with amazing monuments and bakeries for fresh morning pastries (like Maison Roy Pâtissérie for pain au chocolate and croissant). 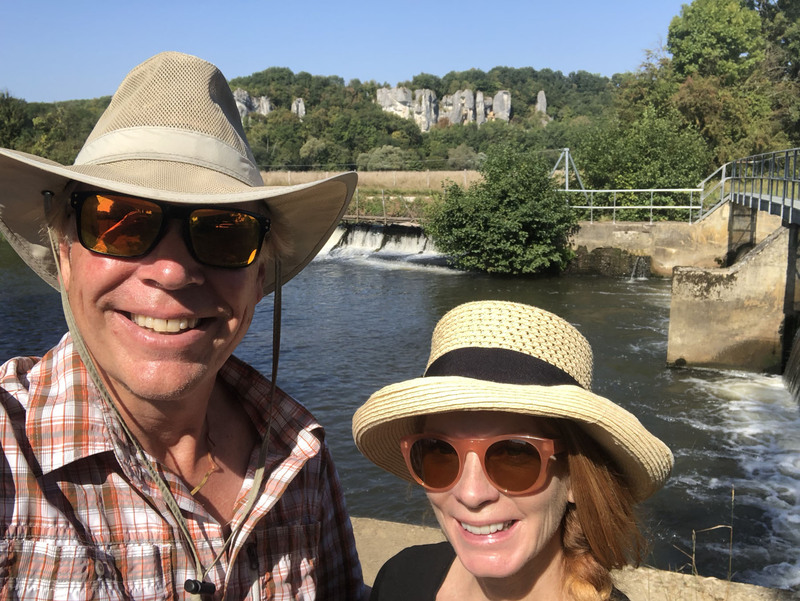 With so much to explore in Auxerre, we stayed two nights, biking to nearby wineries up the hill to Saint-Bris-le-Vineaux, and dining on delicious cuisine (escargot, pâté, duck, rabbit, classic beef burgundy) at L’Accroches and Le P’tite Beursaude – both a short stroll from our dock. 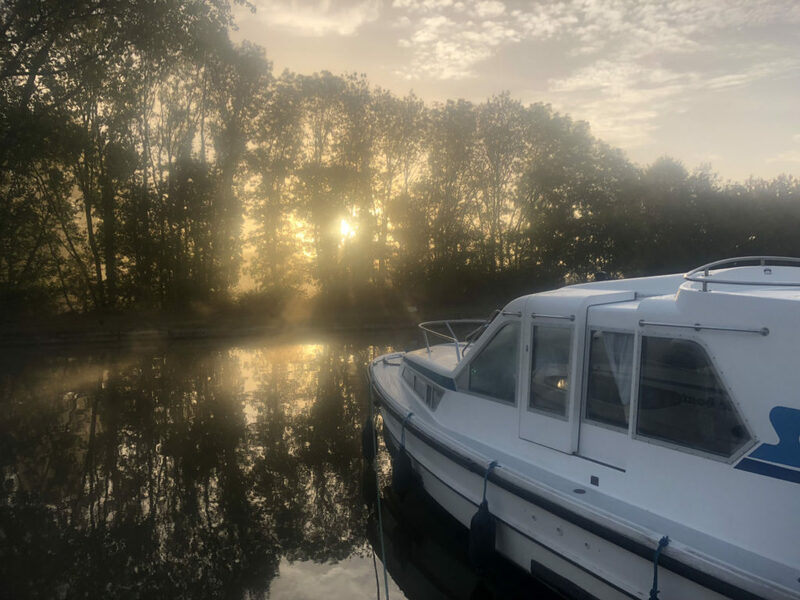 Awakened by church bells, after peaceful sleep aboard our stable boat, we continued our journey on the Canal du Nivernais to the humble village of Vincelles, where we joined several Le Boats in harbor. 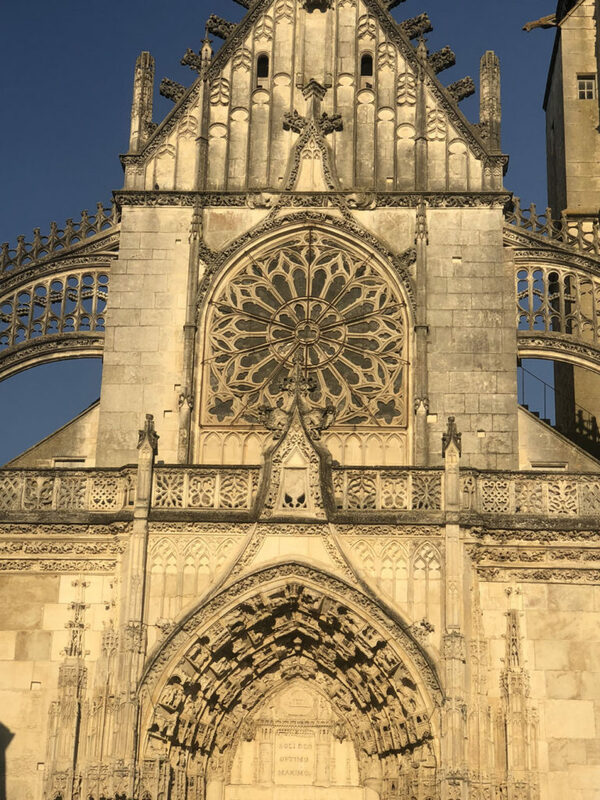 We chatted about our shared experiences. 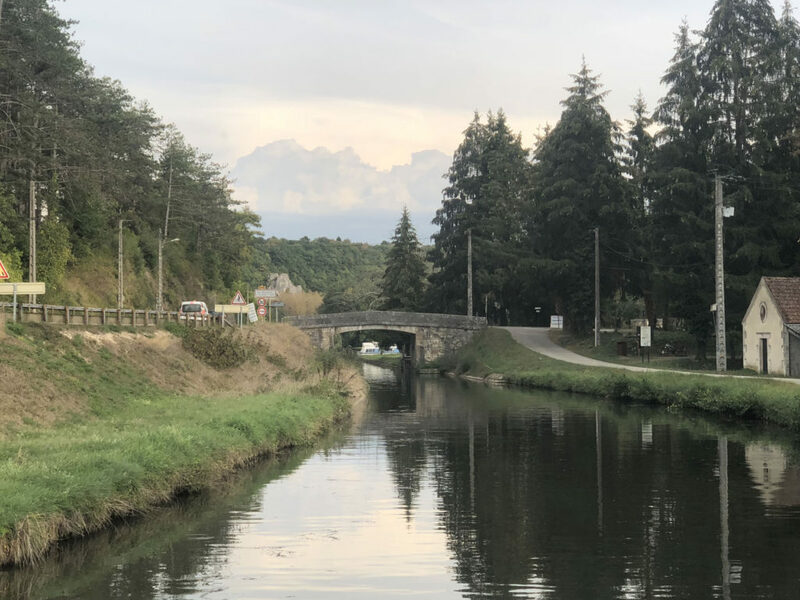 Then hopping on bikes to the market, we provisioned with water, wine, and local cheese which all fit perfectly in my jaunty bike basket. 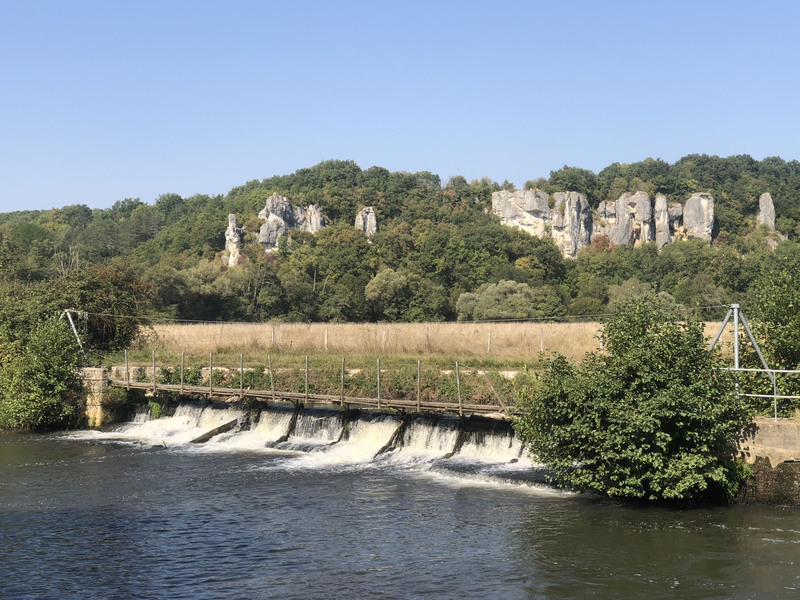 That night we dined overlooking “our river” at Chef-owned Les Tilleuls under the stars. 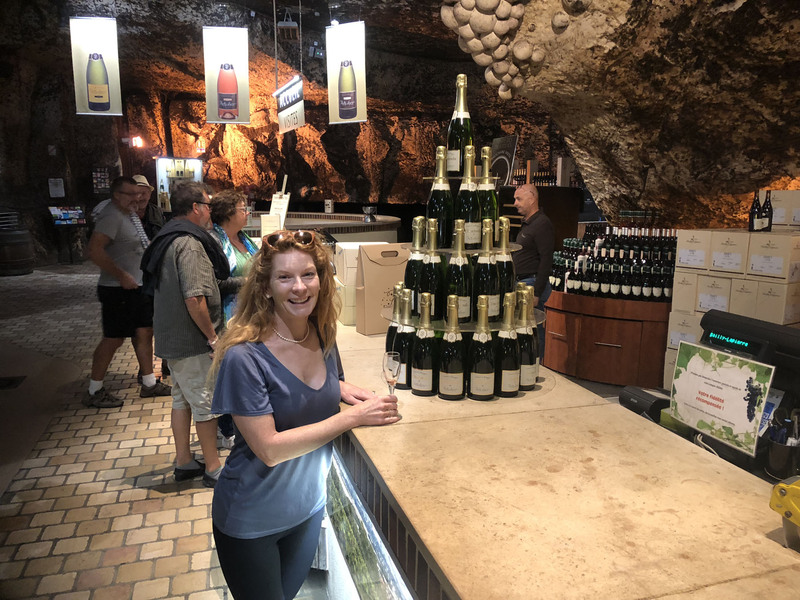 We biked to Irancy next morning, a pretty French hillside town of wine producers, then onto Caves Bailly for a wine tasting in this huge historic cave that quarried stone for Paris landmarks, grew mushrooms, and now houses Crème de Bourgogne wine – 4 million bottles of Burgundy’s bubbly version of Champagne. Châtel Censoir was our next port – a peaceful stone village with a pleasant marina, nearby humble market and restaurant J’Etape serving traditional regional cuisine and more Burgundy wine. 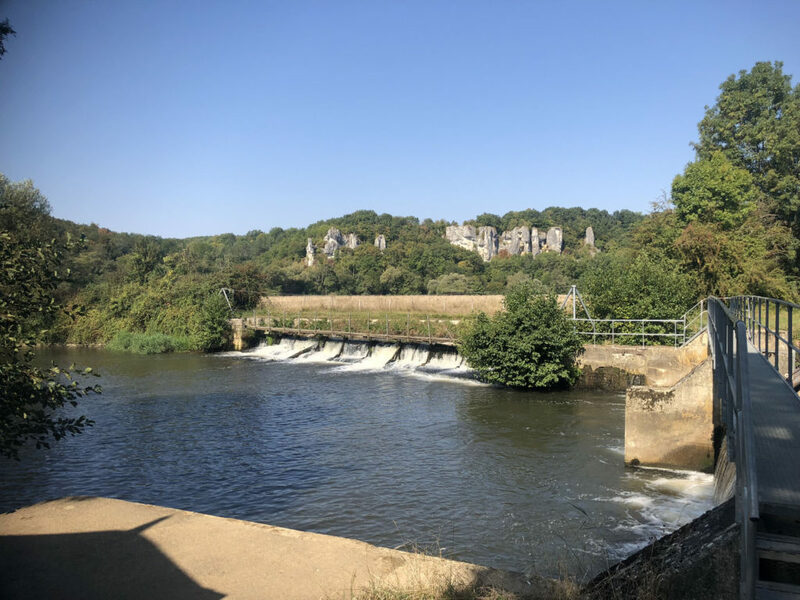 We continued next day to Clamecy. 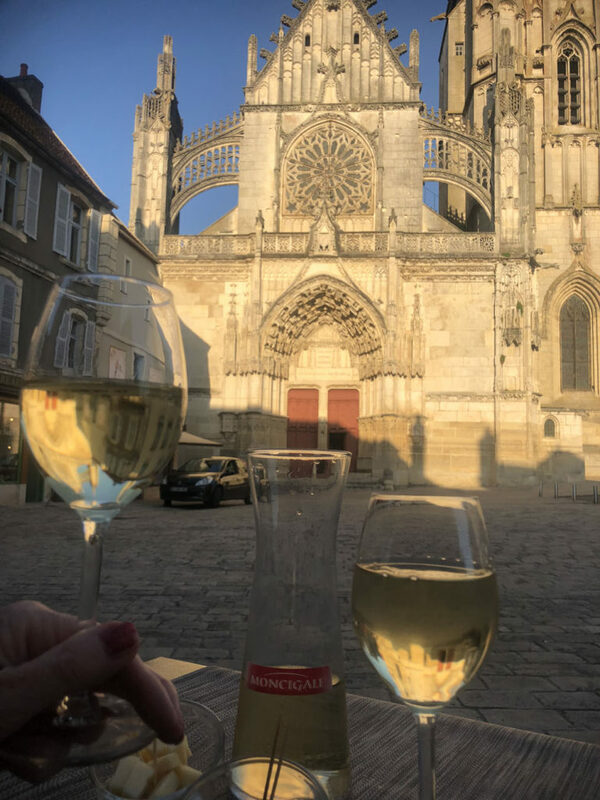 We loved Clamecy so much we stayed two nights. 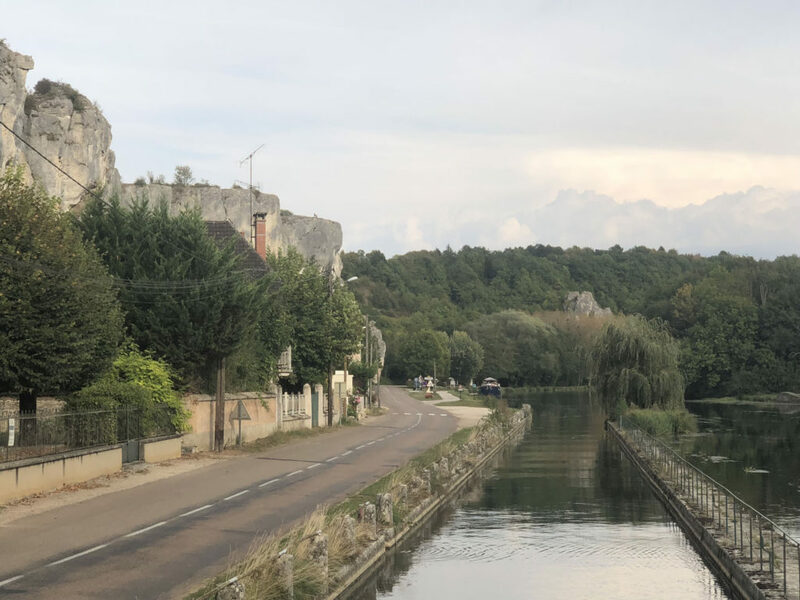 This charming medieval town was pivotal in moving logs down river to build Paris in the 1700s, hence the Canal construction. 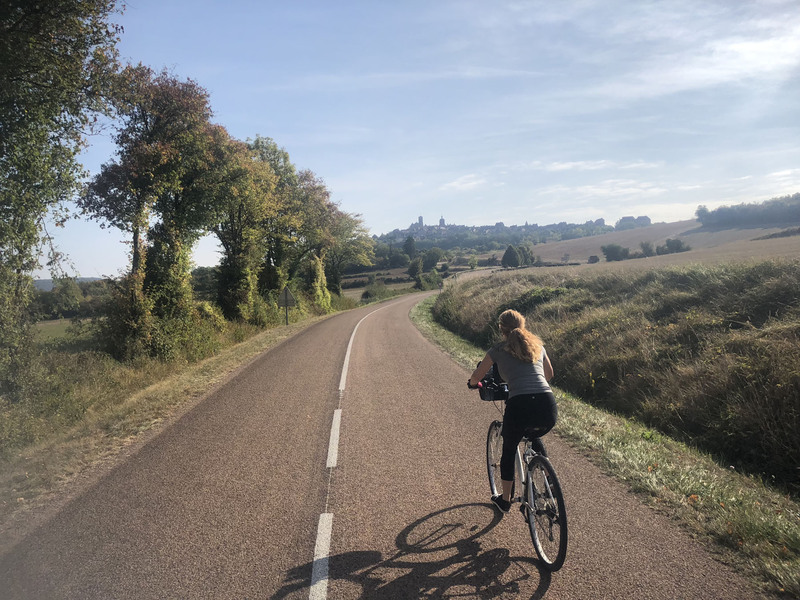 We rode bikes 22-kilometers to Vézelay – an ancient hilltop settlement with a 9th century Abbey. 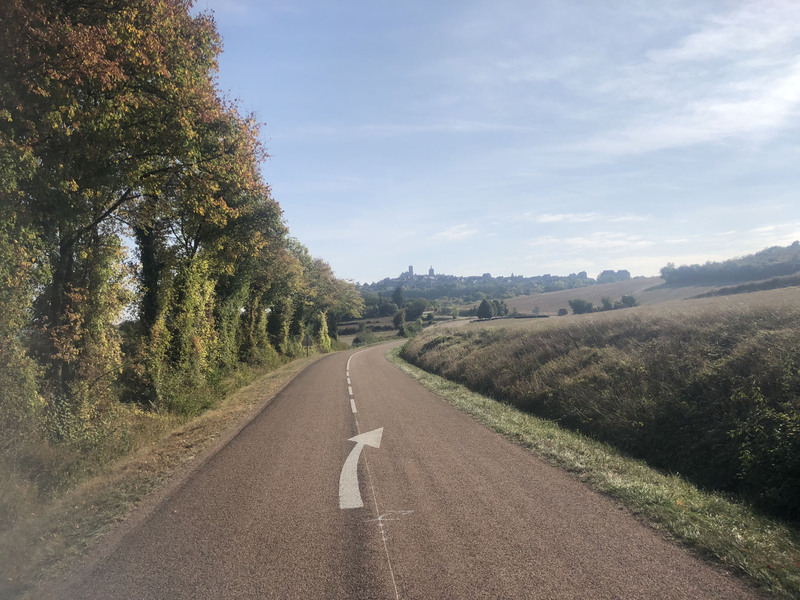 Vézelay is a scene from a vintage postcard – worth our long hilly bike ride, for its amazing valley views and a delightful lunch at Le Terrasse in the plaza of Church of Mary Magdalene. 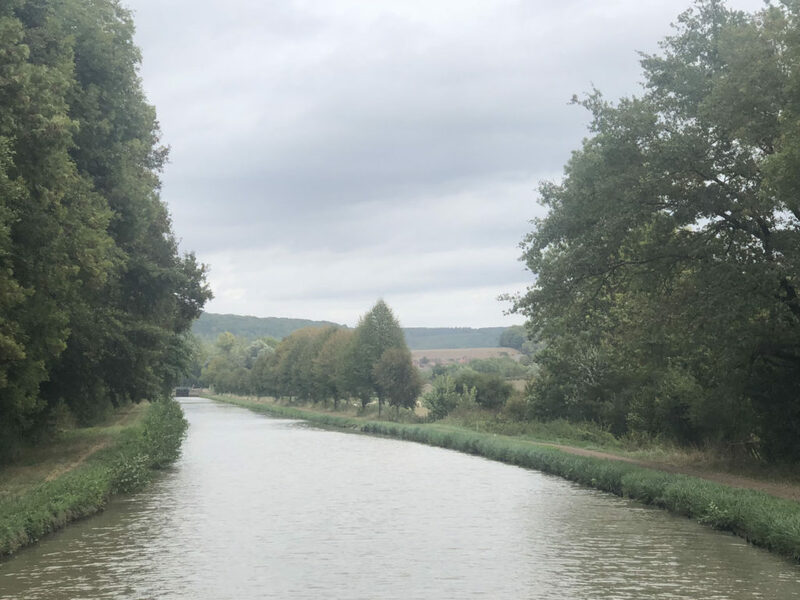 Our last day on board, we navigated 9 locks to our final dock and destination – Tannay. 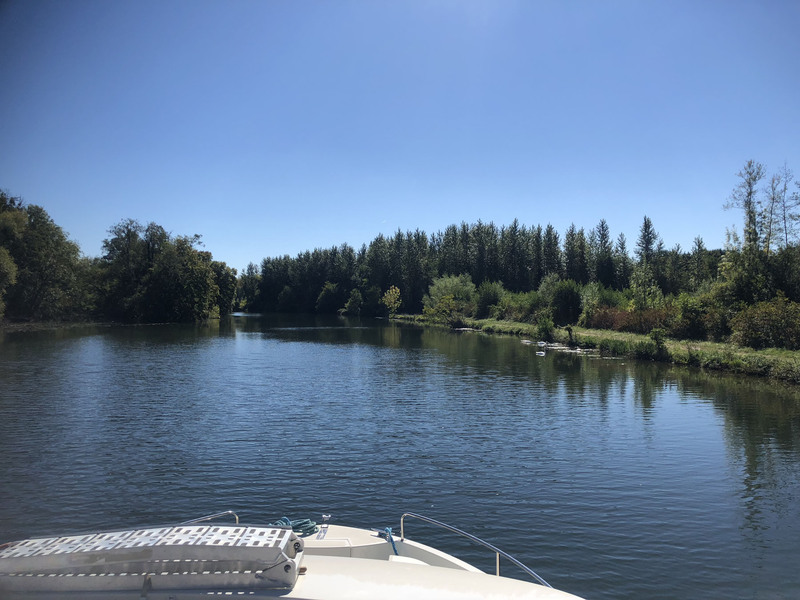 We had become accustomed to the slow rhythm of riding the river, 24 hours total cruising, such a pleasant shift in pace for us from our usual speedy lives. 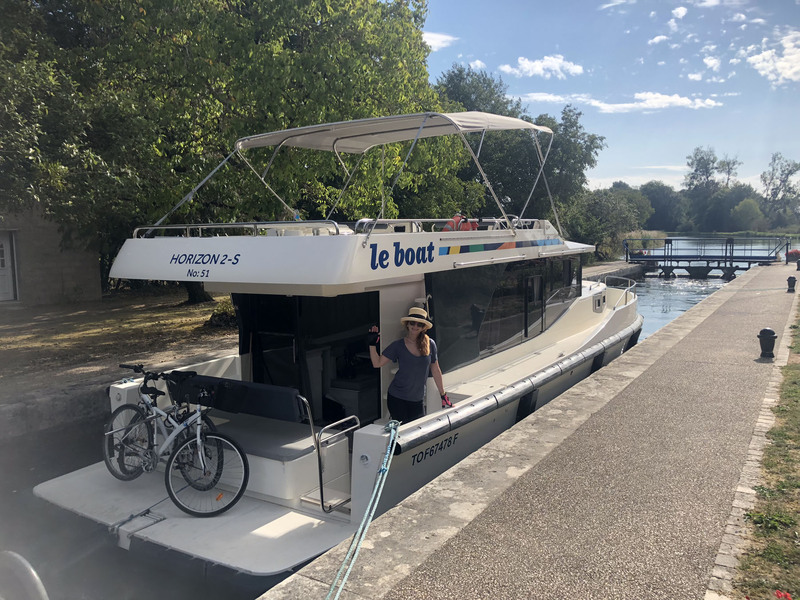 Our one issue, a flat bike tire, but with a quick call to Le Boat on a Sunday afternoon, they came to the rescue and replacement in Auxerre, impressive service. 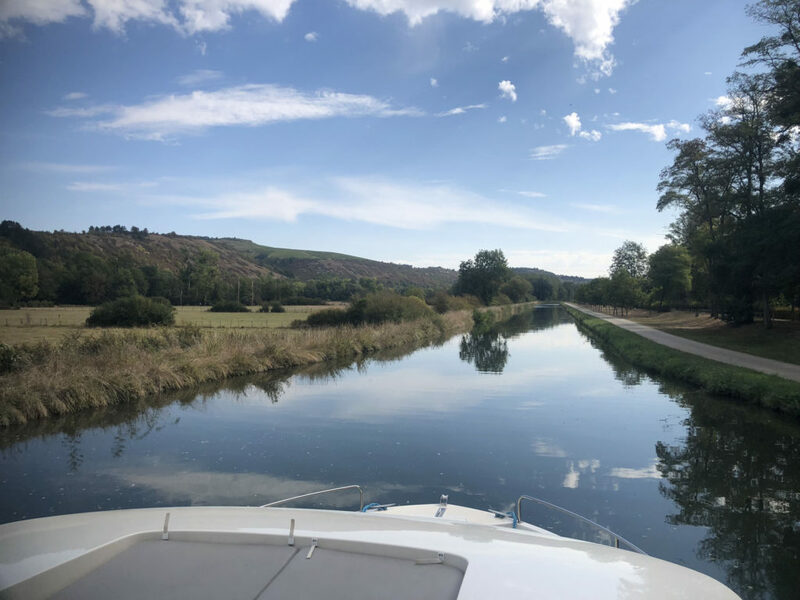 It’s a luxury to travel on a boat through serene ancient countryside, past centuries’ old vineyards and tiny villages. 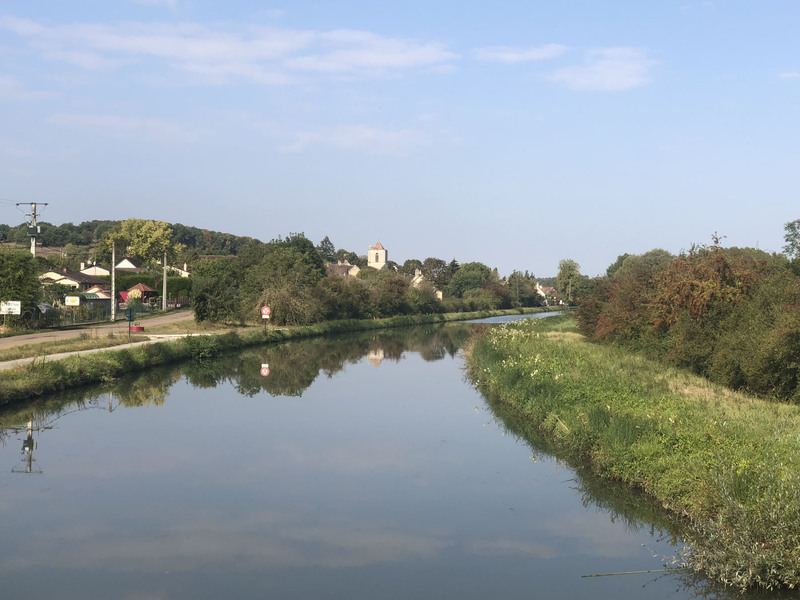 The Burgundy Valley is lovely, the slow-going canal brought us back in time through historic villages, plentiful wine-country during September harvest, with a dose of biking, and all the wining and dining we’d envisioned. 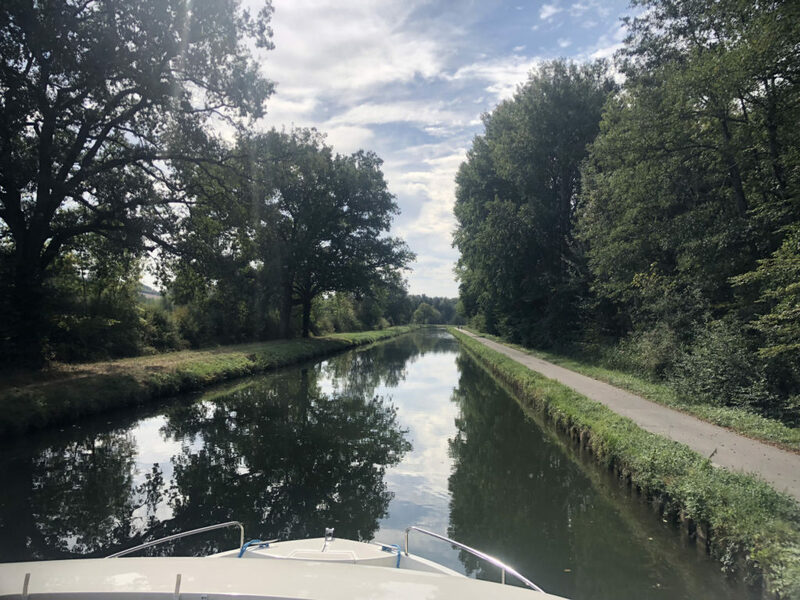 Leaving Le Boat in Tannay, after we swabbed our decks and passed a quick inspection, I was sad our 7-day adventure had concluded. 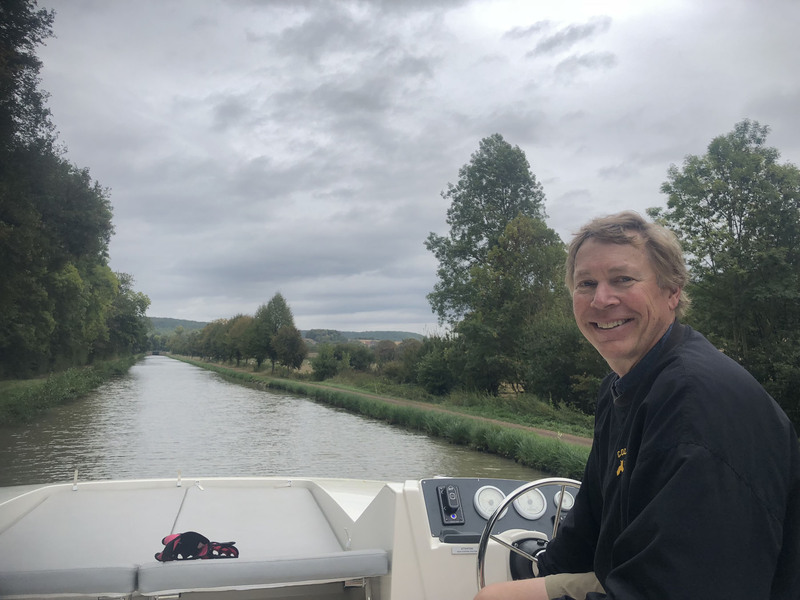 Happy however that we were refunded for unused fuel, my captain turned off our engine in each lock, saving us boat hours, fuel (and $110 Euro). 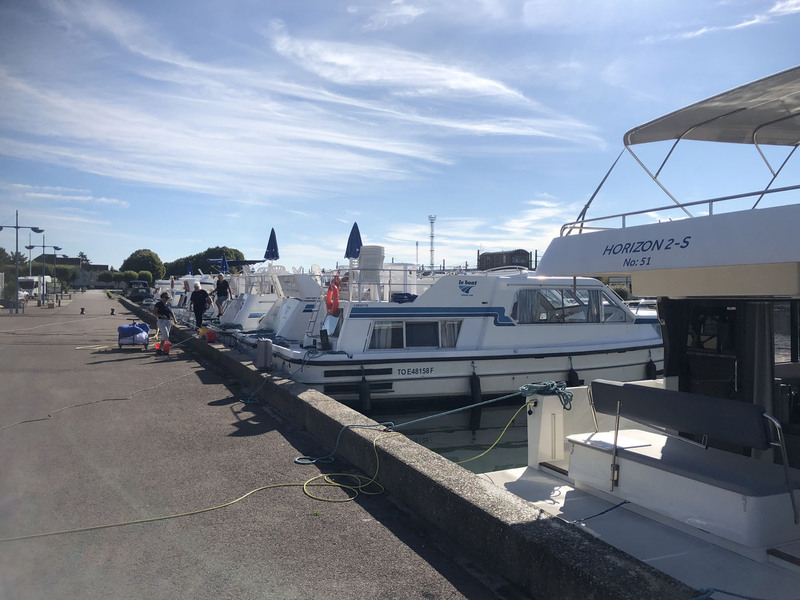 We also saved by self-cleaning the boat upon our return. 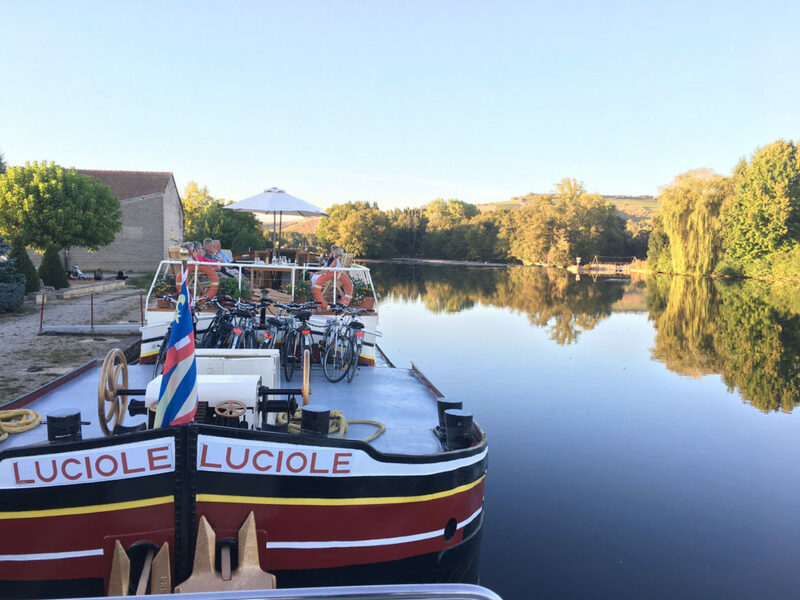 Next voyage, we’ll invite friends, as Le Boat is very social, and relaxed. 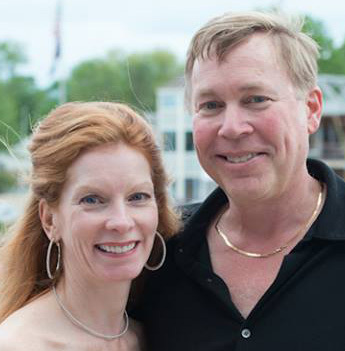 Their boat fleet ranges in design and size, some boats accommodating 4 couples each with their own stateroom and head. 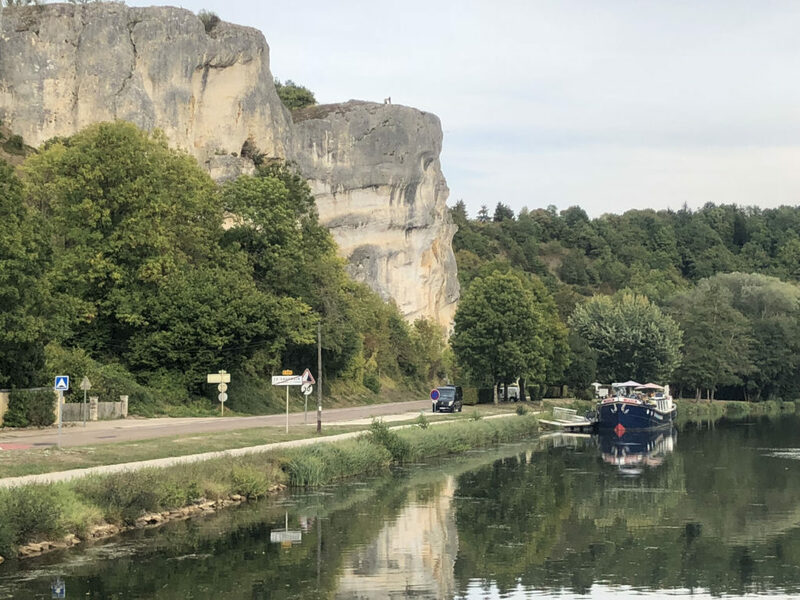 Plus there are so many itineraries through Europe’s best waterways, and Canada’s Rideau Canal. 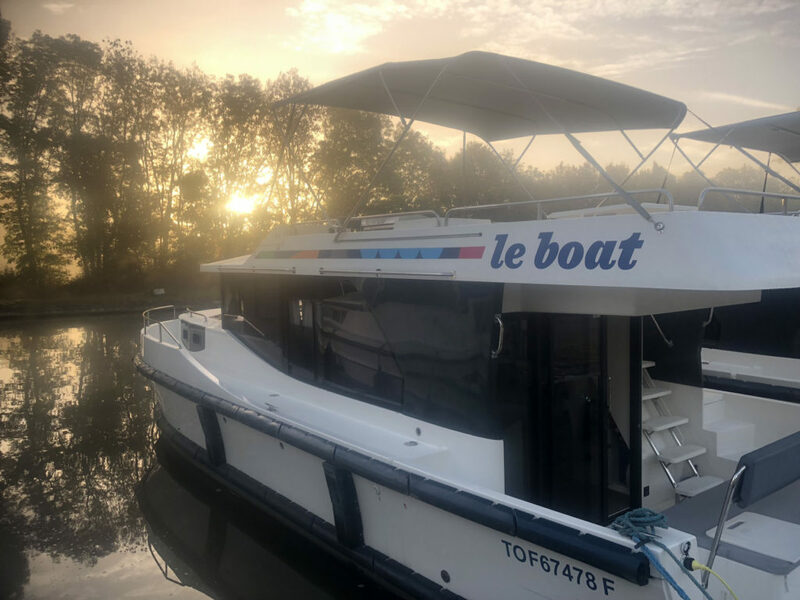 Le Boat is affordable, considering it’s your lodging and entertainment, with a full galley kitchen for onboard dining. 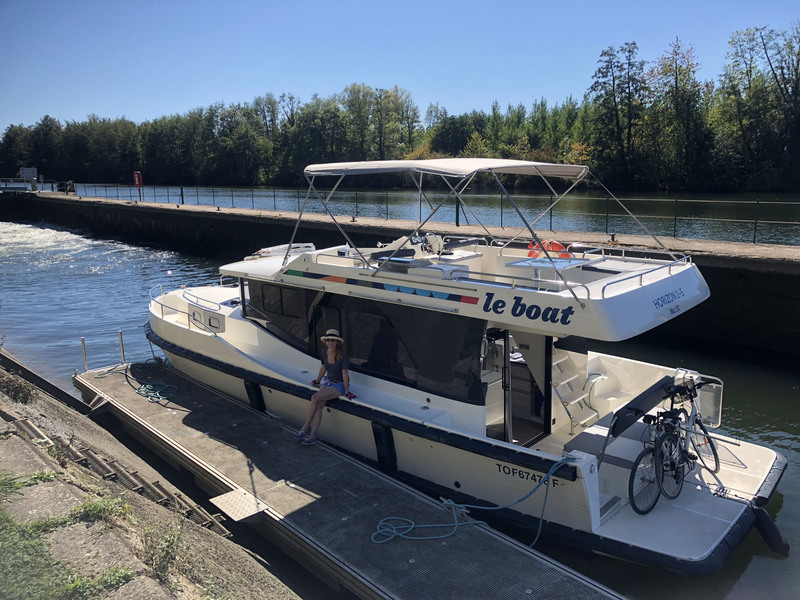 Le Boat for a week ranges from $1,000 – $3,700, depending on the season, location, boat style and size (accommodating 2-12 people). 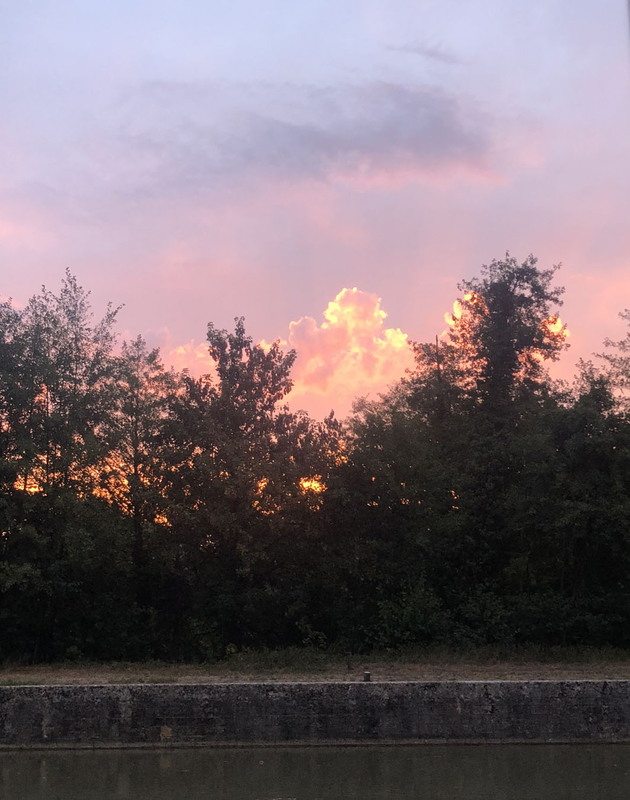 Share the cost with several couples and its even better value. Budget $500 + in extras for insurance, fuel, bikes, sun Bimini, early boarding, one-way trip which we recommend. 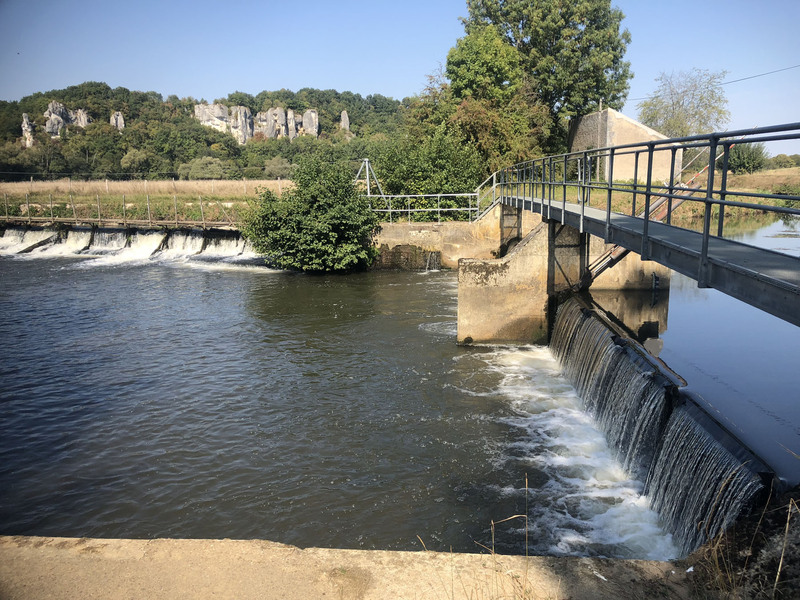 Be patient, and plan for lock timing (10-30 minutes each depending on when you arrive, full and closed, or gates open and ready for you to enter). 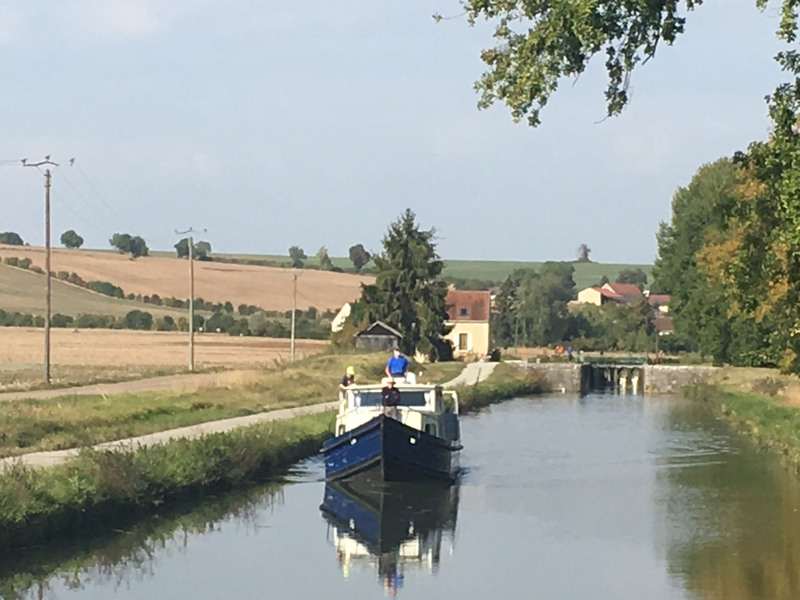 In France, locks are open 9-12, and 13-19 hours. 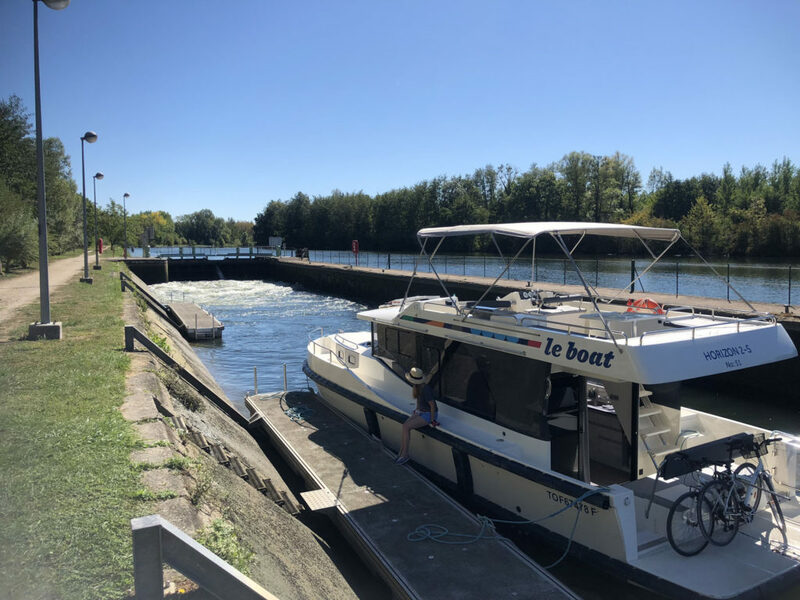 Le Boat provides a handy Timetable of Boating Distances and # of Locks, request this in advance. 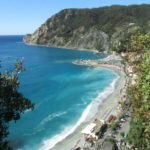 Provision when available, as services and hours can be limited in small towns, and during holidays and Sundays. 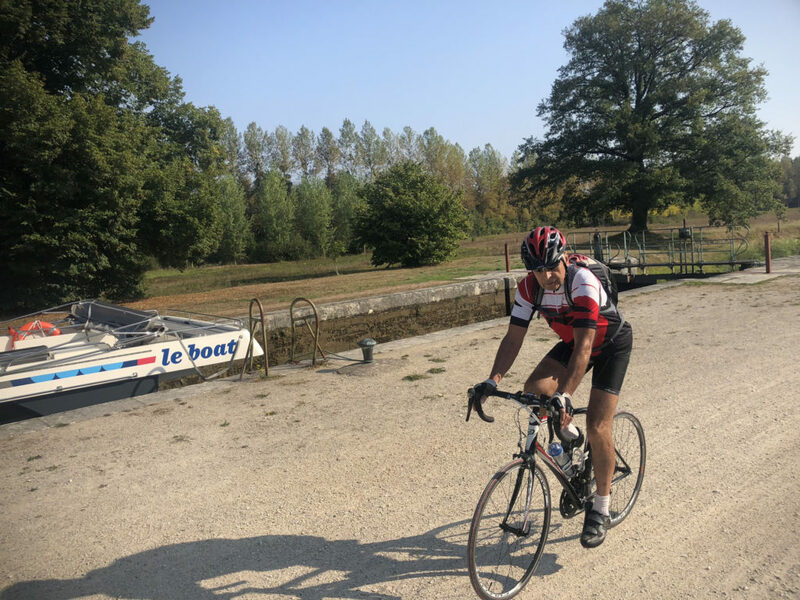 Rent bikes to have on board to ride to villages, shops and wineries. 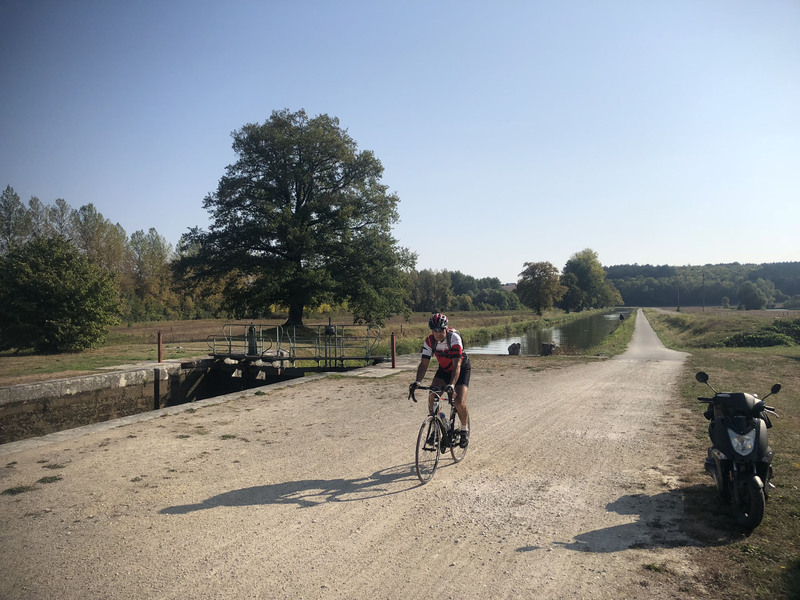 Bike paths along the river canals are relatively flat and ideal for cycling. Pack light, canvas bags are preferred over hard bulky luggage. 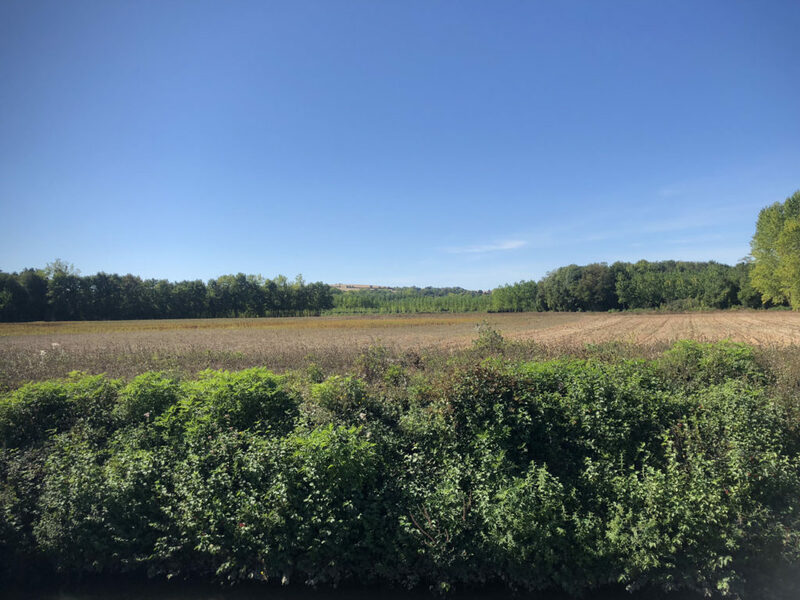 Storage is limited on a boat. Bring gloves for handling lines, boat shoes, and a windbreaker for inclement weather.